Steve Irwin.. A source of inspiration since my teenage years, a true hero and the best idol I could've ever had. He will always live in my/our heart(s). You are my guide in the journey called life, and every time I feel disappointed I bring you in my mind and I keep chasing my dream. Thank you for having existed. when I knew the series \"The Crocodile Hunter\" in my childhood and still in my teens, my favorite hobby was to go to the parks to look for animals to see them and sometimes take pics of them. I used to go to find insects, among caterpillars (that were the only animals that let to take) and I took them to home to feed them, and when they left their crisalys one day I knew what butterfly kind was (I know there was books but it was more amused to see leave them and fly)I even had a caterpillar that was in a corn that my mother had bought and that turned into one fat clothes moth after a time, which gave much laughter to my mom, and once one buterfly was in a jeans that I wear and it put eggs in it. When my family knew Steve\'s series my dad said he was crazy, my father don\'t like I was touched animals (mainly caterpillars) because he said that it was not for a lady, and he said I was crazy! But anyway, when I knew Steve, I don\'t worried more because I knew that there was another person who loved the nature as much as me, and whenever I saw his series, in a wonderful way, I knew it, somewhere there was someone like me!! and that was a magic thing! 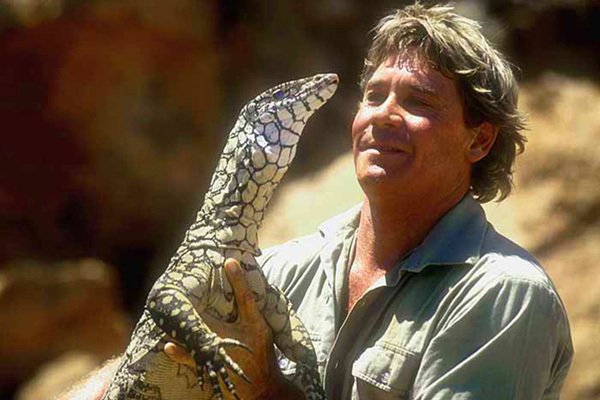 The look on Steve's face while holding this animal he is just so happy! What a beautiful goanna! Steve-o, you changed the way people looked at wildlife. Conservate those animals up in Heaven mate! Ah what a beauty...that lizard is gorgeous...lizards rock..and so does Steve...he changed our world! Steve Irwin is a hero to all and an animal lover! This classic picture is perfect evidence that Stevo was truly a conservationist who cared about nature, and not a showman claimed by those who are missinformed. RIP Mate. Crikey! what a great picture! This 1 of many things i'll miss about Steve!!! LOVE FROM THE USA!!!!!! I am so thrilled that steve irwin did the stuff he did. Go Steve! This is one of my favorite images, Steve looks so respectful and loving, it really makes you see the animal thru his eyes. ITS AS THOUGH ALL ANIMALS SEEMED TO KNOW AND ACCEPT HIM AS ONE OF THEM. I HAVE NEVER SEEN ANYONE GO INTO THE WILD AND THE ANIMALS NOT RUN AWAY LIKE WHEN STEVE WOULD GO THERE AND FILM. A TRUE KEEPER OF THE ANIMALS!